This Dutch prog rock band is rooted in the late Eighties, the prime mover was guitar player Bastiaan Peeters and two American friends on drums and keyboards. In ’87 ODYSSICE released their debut-demo "Track one", a fine blend of RUSH and CAMEL. The future looked bright when ODYSSICE even reached the national radio (the famous live rock-program Countdown Café) and they played on a prog rock festival in Belgium along with NOW, EASTERN WIND and fellow Dutchmen EGDON HEATH in ‘89. The line-up in those days was Bastiaan Peeters (guitar), Bart Kuhne (drums), Erik Aafjes (bass) and Andrae Hubbeling (keyboards). Unfortunately some members were not able to concentrate on the band. The band seemed to belong to the past but in ‘96 ODYSSICE made a mini-CD (four songs) entitled "Moondrive", it has strong echoes from CAMEL (melodic and Latimer-like guitarplay). Bastiaan recruited for this CD Jeroen van der Wiel on keyboards, Pascal van de Pol on bass and Bart Kuhne on drums. In ’97 ODYSSICE were invited to perform on the Dutch prog rock festival Progfarm. Drummer Menno Boomsma replaced Bart Kuhne, he was too busy with his work and skating (a typical Dutch sport). Their performance was a success and things started to grow for ODYSSICE. 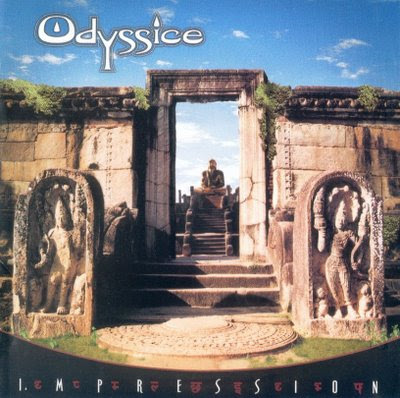 In 2000 ODYSSICE released the CD entitled "Impressions", a strong, 24-carat symphonic rock album with echoes from CAMEL but also some ethnic elements. It has very decent sales for an own production. In 2003 "Moondrive" was re-released as "Moondrive Plus" with two bonus tracks ("Losing Her" and "Powerloc") and some extra’s. Meanwhile Pascal van de Pol is replaced by Gijs Koopman (ex-CLIFFHANGER) who’s not only a very good (Rickenbacker) bass player but also skillful on keyboards and Moog Taurus bass pedals. The prog fans are eagerly waiting for a new ODYSSICE album in 2004. The album "Impressions" is in the vein of the mini-CD "Moondrive" but with more mature and alternating compositions. Jeroen delivers a lush keyboard sound (piano, Mellotron – and Moogsamples) in some songs but the focus is on Bastiaan Peeter with his sensitive guitar play and the use of a guitar-synthesizer (spectacular – and surprising sounds). The progress of this band is emphasized by the integration of ethnic elements from Scotland, China and India, very beautiful and a proof that ODYSSICE is on the way to develop their own sound. I’m sure this album will please a lot of symphomaniacs!